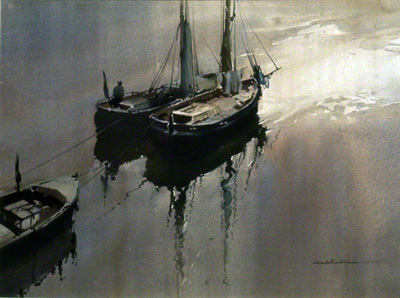 A classic example of Claude Buckle's technique of painting boats on water. In this picture Buckle has chosen the days end as the title to describe this atmospheric picture. Notice the watery reflection effect of the sails in the water, a true characteristic of a buckle painting. The boats depicted may have been Thames Sailing Barges or commercial vessels owned and worked by a family group. Created in 1970.